Use Quikrete® Quikwall® Restoring Walls for: dry-stack concrete block construction (without mortar), waterproofing and strengthening block walls built with mortar, rehabilitating existing walls with a water-resistant and decorative coating, beautifying block walls. QUIKWALL® Surface Bonding Cement adds strength, durability, and water resistance to walls made of concrete, cinder block, brick, terra cotta tile and stone. It is an ideal material for restoring and/or beautifying buildings, walls and chimneys. QUIKWALL® Surface Bonding Cement is also an excellent coating material for cisterns and other concrete water holding tanks. It can be used to repair silos and other farm buildings. QUIKWALL® Surface Bonding Cement is very effective in restoring the walls of older buildings that have begun to crack and loosen from the effects of time. A 1/8″ coating of QUIKWALL® SBC on the outside of the walls makes them practically impermeable to cold air drafts and also provides weatherproofing, so it is particularly suited for the renovation of basements and other block structures and walls. Clean all walls thoroughly to remove all paint, oil, dirt and other foreign matter that can interfere with the bonding of QUIKWALL® Surface Bonding Cement. On porous walls, wet the wall surface with a fine spray mist or use a heavy sponge to dampen the surface prior to applying the QUIKWALL® SBC. Load the finishing trowel with a good amount of mix and apply a 1/8″ thick coating of QUIKWALL® SBC to the wall. Work from bottom to top, using an upward sweeping motion. 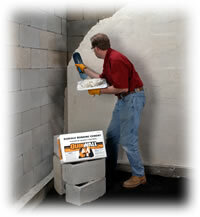 Push the material into any cracks and broken areas of the wall. Texture-swirl the material as you apply. Do not wait to give QUIKWALL® SBC its final finish. Moist-cure the walls after 8 hours by dampening them with a fine spray. Repeat several times daily for 3 days. Machine using power mixer. Do not apply QUIKWALL® Surface Bonding Cement if temperatures will exceed 100° F or fall below 40° F within a 24 hour period. Do not add winter admixtures or other additives to the mix, except QUIKRETE® Concrete Acrylic Fortifier when needed. Do not allow premature drying of the coating, which can lead to cracking and other failures. Cure properly. Use QUIKRETE® Hydraulic Water-Stop Cement to repair holes and to stop running water. Click Here for more information on this product.